Sabrina refusing to sign her name forces the coven to sue her, and strip her aunts of their power. She has to go to court and prove she is innocent and she asks Daniel Webster to help. He is a lawyer that has won in witch court before and he first rejects Sabrina but later helps her. First Father Blackwood says all Sabrina must do is apologize for breach of promise and sign the book which she refuses. This turns into him revealing that her father already signed her name in the book three days after her birth with Zelda because that was what he got in exchange for gaining permission to marry her mother. Then Webster says she shouldn't be tried only by witches when she is half mortal, which Father Blackwood uses to say that she can allow her body to be searched publicly for a mark and that will settle everything. Sabrina wants to agree to it after Harvey finds no marks on her, but Hilda reveals in court that she went with Sabrina's mother to a Christian church one day after her birth to baptize Sabrina. This means Sabrina doesn't owe anything to the Church of Night. The deal then becomes that Sabrina is allowed to have her mortal side but she must attend the school of magic. 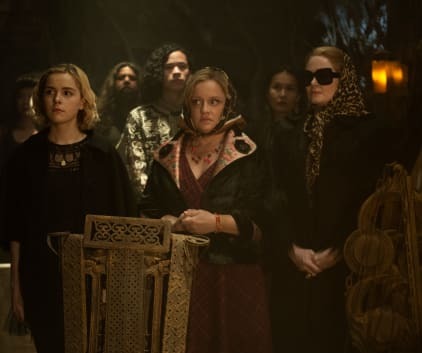 Along the way Sabrina also finds out about the deal that Webster made with the Dark Lord, he was forced to defend horrible people and one that he let free killed his daughter who Madam Satan creates visions of to try to convince Webster to stop helping Sabrina. Hilda gets excommunicated from the Church though. Meanwhile, Harvey's dad forces him to work in the mines which he doesn't want to do because when he was younger he was there and he saw what we assume was the Dark Lord. He can't go through with it and his brother sends him home and defends him against his father that night. Roz is surprised that she can't write about a book that she loves which makes her realize that a lot of books are banned by the school. In an effort to quickly force the school to reconsider, the wait forces her to reveal that she has a condition that in three months will have her going blind. Madam Satan can be seen using that information to possibly torture Roz. Also, Ambrose finds a lizard that was Conner's familiar. He thinks he can get him to talk and say what he knows but Zelda informs him that the familiar will miss their warlock enough to die a few days later. That ends up happening before Ambrose can find anything out. He does sleep with Luke, a possible ex-boyfriend of Conner's that he meets at the funeral. Permalink: Give it here. I'll make it quick. Hilda can fashion it into a purse.